Robert Hirsch's Exploring Color Photography is the thinking photographer's guide to color imagemaking. 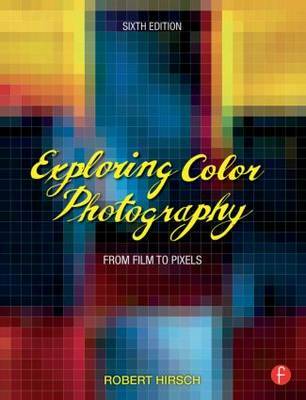 Now in its sixth edition, this pioneering text clearly and concisely instructs students and intermediate photographers in the fundamental aesthetic and technical building blocks needed to create thought-provoking digital and analog color photographs. Taking both a conceptual and pragmatic approach, the book avoids getting bogged down in complex, ever-changing technological matters, allowing it to stay fresh and engaging. Known as the Bible of Color Photography, its stimulating assignments encourage students to be adventurous and to take responsibility for learning and working independently. The emphasis on design and postmodern theoretical concepts stresses the thought process behind the creation of intriguing images. It's extensive and inspiring collection of images and accompanying captions allow makers to provide insight into how photographic methodology was utilized to visualize and communicate their objectives. The text continues to deliver inspiring leadership in the field of color photography with the latest accurate information, ideas, commentary, history, a diverse collection of contemporary images, and expanded cellphone photography coverage. A "Problem Solving and Writing" chapter offers methods and exercises that help one learn to be a visual problem solver and to discuss and write succinctly about the concepts at the foundation of one's work. Exploringcolorphotography.com, the companion website, has been revamped and updated to feature more student and teacher resources, including a new web-based timeline: As It Happened: A Chronological History of Color Photography.